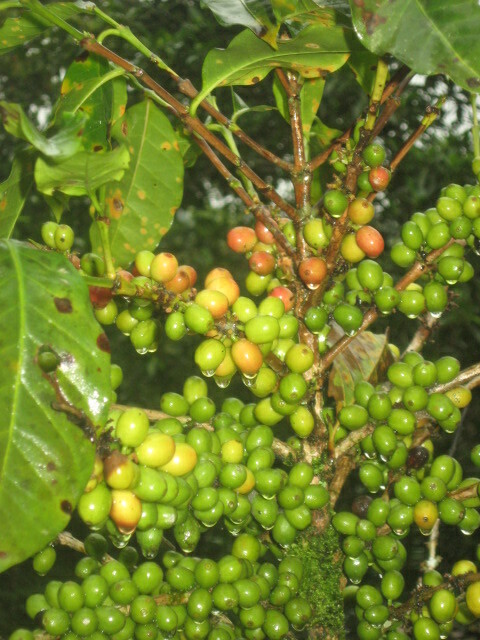 Finca Esperanza Verde (FEV) produces organic certified, shade-grown coffee. Various trees, including productive fruit trees (bananas and papaya) provide vital nitrogen while the oak and ‘barazan’ are planted for reforestation. 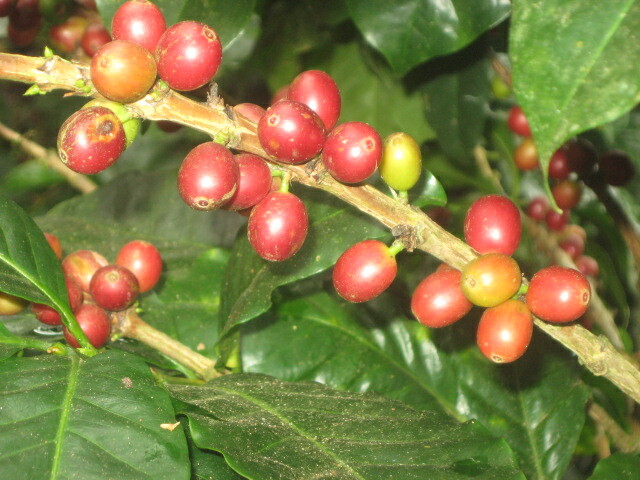 Coffee plants take 2-3 years to produce their first fruit, blooming 2-3 times per year, but producing fruit one time per year. Each plant is productive for 8-10 years before replanting must occur. FEV utilizes the husks, leaves etc. to produce their own worm compost for their organic coffee farm. There are many coffee farms in Nicaragua, but unlike American farms, coffee workers walk long distances to get to the fields where they will pick anywhere from 8-10, 5-gallon bags per person, per day. Larger farms can harvest up to 15-20, 5-gallon bags per person, per day. In most cases, the coffee workers and their family members then carry the bags of coffee beans to the farm or market for sale. At the time of our visit, the average pay per bag was $2, or anywhere from $16 to $40 per person, per day. 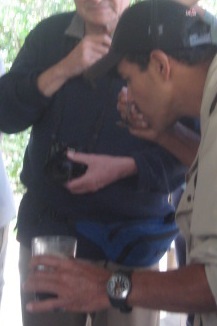 During our ecotour excursion, about 20 novices picked 3/4 of a gallon of coffee beans in 1.5 hours. I am in awe at the skill and efficiency of the Nicaraguan coffee worker. It’s a manual job. There are no John Deere Combines that do this job in the steep, rainforest conditions. 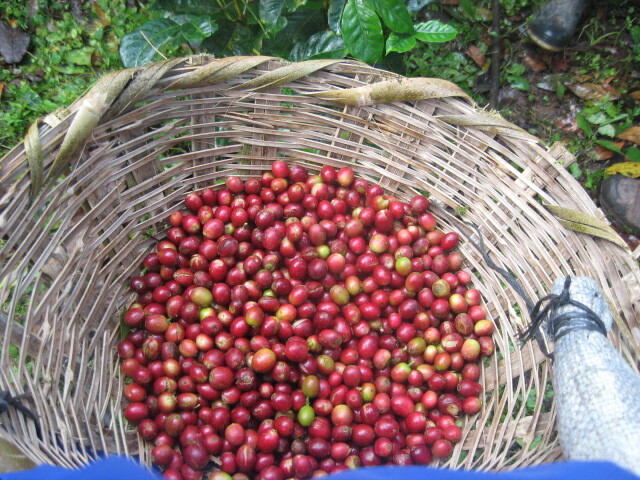 Each coffee bean must be carefully picked to assure that the stem will produce another fruit next year. And the processing has yet to begin. The coffee beans are put in water, to sort the floating inferior beans. The beans are then hulled to remove the red, outer husk. The coffee beans inside the husk are typically beige in color and are covered in a slightly sweet, sticky gel. At this stage they taste nothing like the dark, sometimes bitter coffee we drink each morning. The beans are wet processed, removing the skin of the coffee bean, then followed by a fermentation bath that eats away the pulp, leaving the bean. 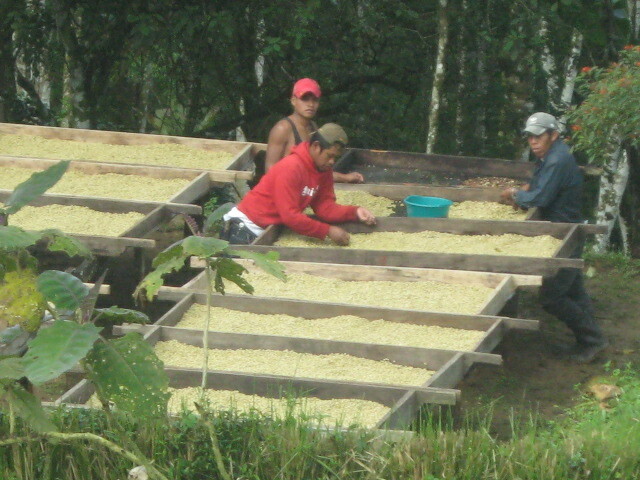 The beans are dried in the sun, with any remaining residue removed by the coffee workers. The beans are then sorted by grade. The FEV cooking staff spent an afternoon showing us how the locals roast the dried coffee beans over a wood stove, until the beans reach the desired richness. 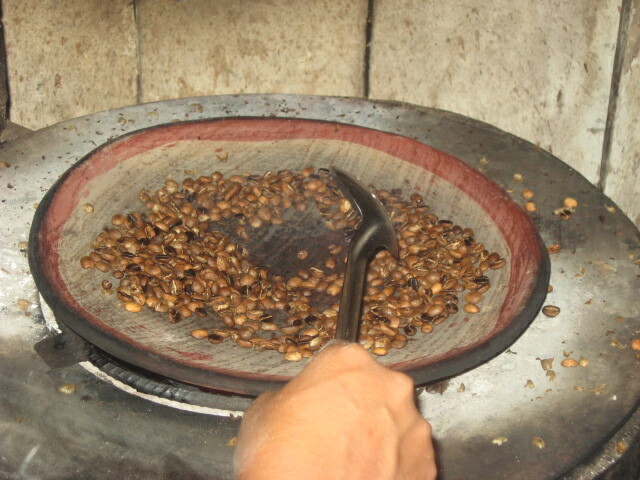 As the beans roasted over the fire, another paper-like shell was released and blown away from the roasting beans. At this point, the beans are ready for the grinder. At home, I would throw them in my electric coffee grinder and be done in a few seconds. The locals use a heavy duty hand grinder that builds muscle, and a little character. In rural Nicaragua, you have to work hard to have your morning cup a Joe. Coffee cupping is another term for coffee tasting, experiencing the flavors of different brewed coffees. 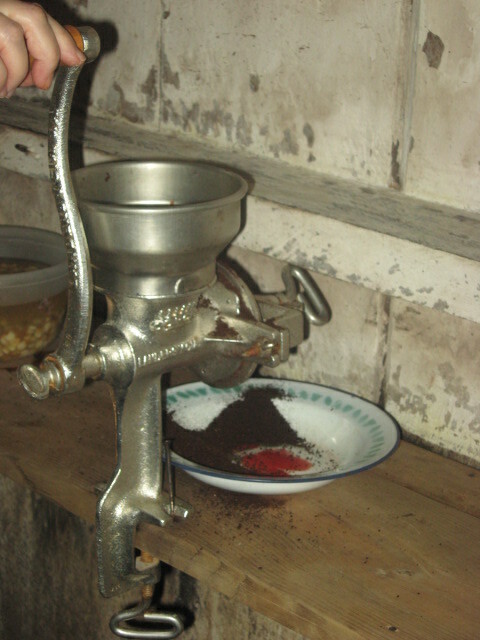 The grounds are often left in the coffee. The coffee, after being sniffed, is then slurped into the mouth allowing the back of tongue to experience the full tasting detecting body, acidity and sweetness. Experienced coffee cuppers can distinguish the coffee origin in this tasting experience. We had the unique experience of visiting another local coffee farmer and his family for a cupping experience. Can’t say I’m a big fan…couldn’t get over the coffee grounds but appreciate the process! For years I have purchased coffee at the local grocery store without a thought as to how it was grown, harvested and prepared. It was just…coffee…my morning ‘pick me up’. 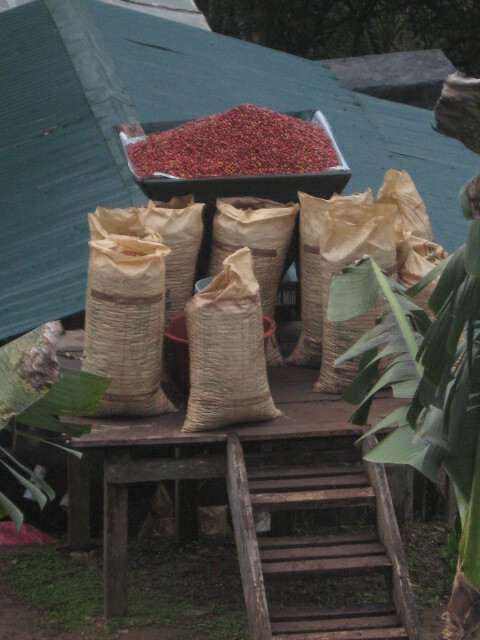 Coffee growing and processing is, in so many ways, primitive to our way of thinking. Farm life in the USA is hard work but we have so many tools in our toolbox. The coffee farmers and workers have 1) their feet, 2) their hands and their backs. They make it work. I’ll think of that every morning the rest of my life as I sip on my morning coffee. Thank you coffee workers. Where would we be without you? Very interesting Cathy. There a many things that make our lives easier every day that we take forgranted. You have made me now take pause and think about what goes into the coffee i love so much. Thanks for your comments, Karen! It truly has changed my views and I cherish every bean that goes into my morning coffee!